Okay, it is January, early days in the calendar, almost a new Lunar New Year, and the ideal time to bite the bullet, get back on the horse, face the music, any of those clichés will do. I am peeking around the corner, peering into my kitchen, realizing I have to get back in there and have another go at enrobing. I am still terrible at it. It makes me use language worthy of the saltiest sailor. It makes me verklempt. But I really want to get better at it – at least competent enough that I can make a decent palette shaped bon bon, suitable for decorating with a transfer sheet. 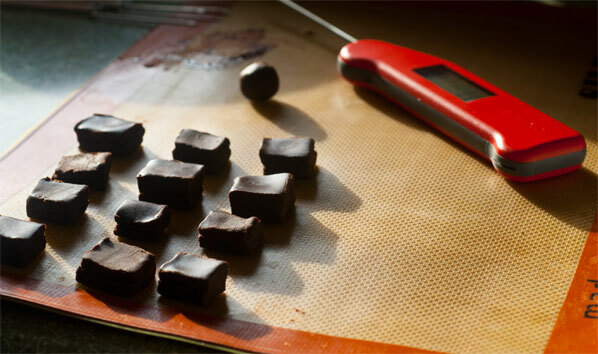 And to be worthy of a transfer sheet, the bon bons need to be perfectly level on top. They need to not have any skirts or pools of chocolate oozing off their bottoms. This requires a deft and sure hand. I look down at both of mine. They can do many things, but mastering the dipping forks does not yet seem to be one of them. Some wise advice from Pam at Ecole Chocolat is to try much smaller pieces than the massive Twix bars, involving two different layers, I tried to dip last time. They ended up with a very thick coating of chocolate, which I am pretty sure had fallen out of temper, by the time I finished the batch. Sort of cloudy and pock-marked, they still tasted fine, if a bit of a mouthful, but without that gloss and snap and mouth-feel I experience in the work of the chocolatiers I admire, and which I want to produce. 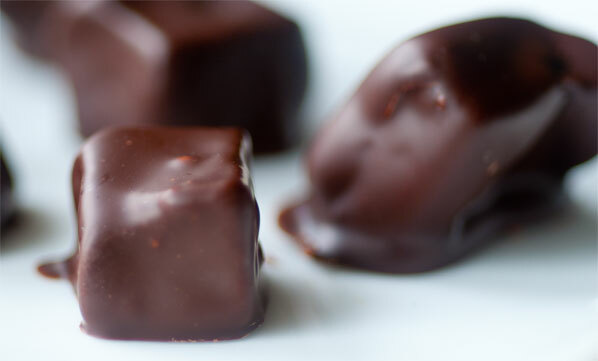 Pam suggests dialing things back and having a go with small squares of crystallized ganache. 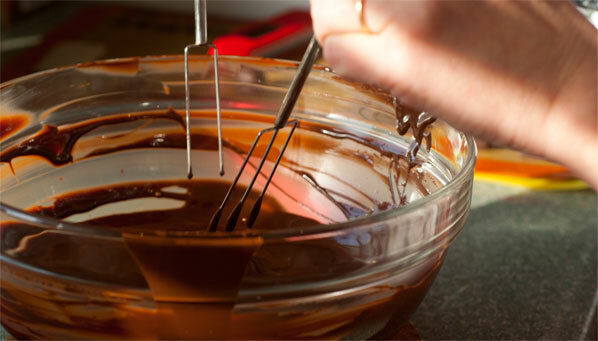 I love everything about ganache, so this seems wise advice to get me jump-started. I decide to keep things as simple as possible, since the purpose of this week’s work is to enrobe, not to come up with any fancy-pants flavours. I therefore go back to the pure (and quite delicious) dark chocolate ganache, made with equal parts barely simmering heavy cream (added in several small increments) and partially melted chocolate, and beaucoup de friction. 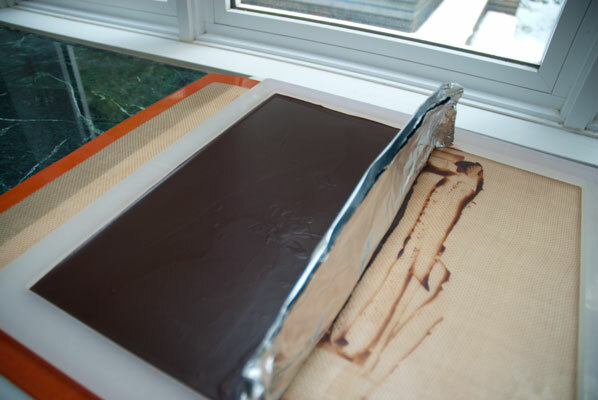 Once I have achieved emulsification, I pour the smooth ganache into a square plastic ganache frame, over a marble slab and Silpat mat, to let it crystallize. We have been having a cold spell, so I have every confidence that the marble surface in our bedroom alcove window will suffice to let this set up, undisturbed – provided we keep Ozzie, the cat out of the bedroom. The next morning, I head out into the unexpected snowfall, to an audition. My lovely partner has decided to drive me there and back, as he learned how to drive in the blizzards and ice storms of the Prairies, unlike me, the born-and-bred “it’s a wet cold” Vancouverite. Since I have to temper chocolate when I get home, he decides this is the perfect day to go to the Gourmet Warehouse, and pick me up a good, accurate (and expensive – ack!) 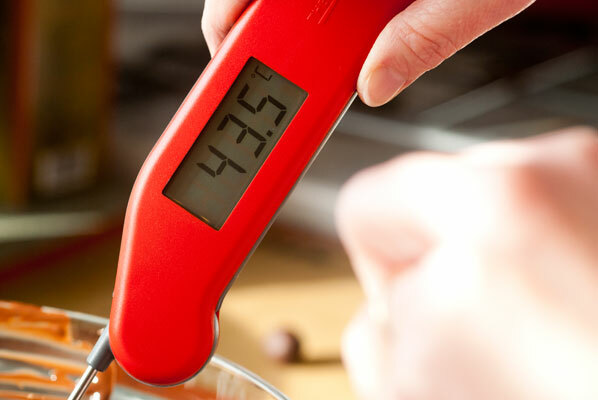 digital thermometer. 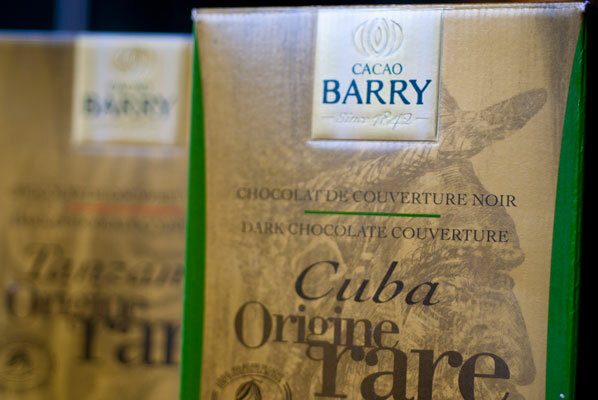 While there, I also pick up two boxes of Cacao Barry couverture pistoles, from their Origine Rare line. 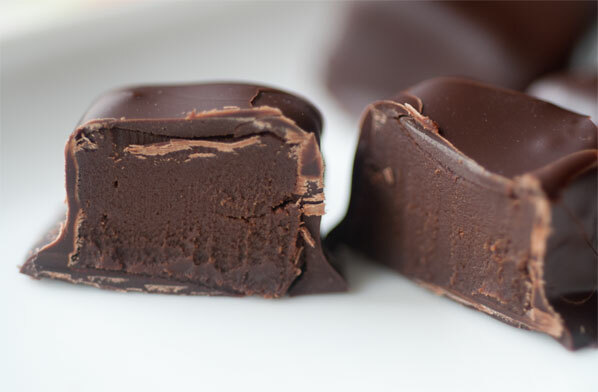 These, to me, are the height of luxury, as it means I don’t have to chop up a block of chocolate, and instead, can simply pour the correct amount by weight, to be tempered, onto my scale. Easy peasy. I pick up a 2.2 kg box of CUBA, which has “a good balance between bitterness and richness, spicy taste and freshness” and another of TANZANIE: “powerful and sharp with fruity, spicy notes”. We arrive home, and it is time to face the music (had to get one more cliché in there). I have decided to seed temper this time, especially since I am using the CUBA pistoles. I weigh out a pound (454 gms), then remove 4ounces (113 gms), to be used as seed. 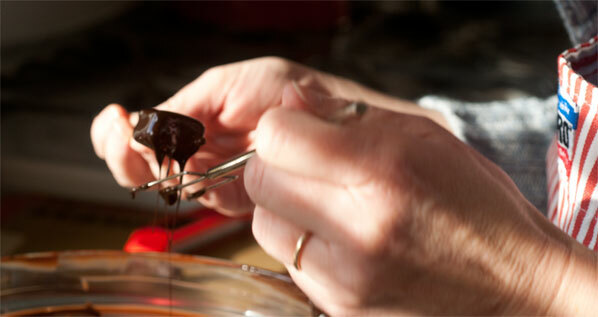 I read and re-read the instructions for tempering by seeding, as it has been a while since I have used this method. It all makes sense, I think it has gone into my brain in a logical order, and I set up my zone, complete with silicon mats, extra tea towels, silicon spatula, glass bowl of chocolate, thermometer, and box of pistoles to reference check melting and cooling points, for this particular brand. I also dig out the dipping forks I have not used for a few months, then go to check on what should be a perfectly crystallized ganache. And this is where I am scratching my head. Although the ganache looks beautiful, glossy, no streaks, well emulsified, I expected it to have set to a much firmer consistency by now. The ganache is soft and pliable, and I am able to cut small squares of it, but am fearful of what will happen when I start to enrobe them. I double up the layers and squish them a little so they are taller. I will do a dozen of these, then leave the rest of the ganache to hopefully firm up over the course of the day. 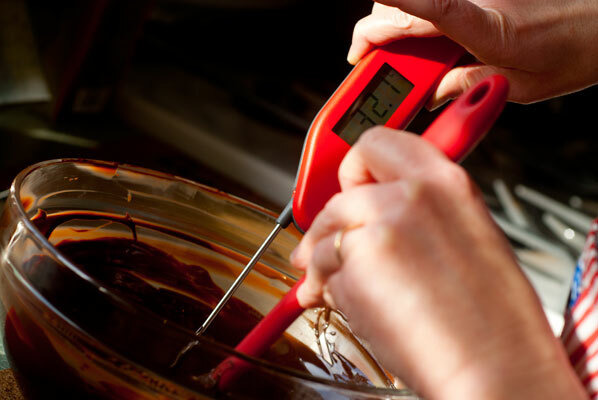 Setting my microwave oven on defrost (50% power) I slowly melt the chocolate, stirring to melt, and checking the temperature with my brand spanking new Thermapen thermometer. It does make a difference, I must say, as I get a reading almost instantly, and do not have to stop stirring for more than a few seconds. 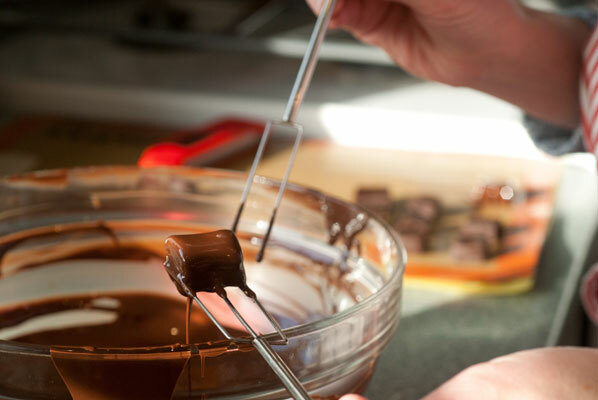 When I get a reading of 45 degrees Celcius (the box says the optimum melting point is between 45-50), I toss in most of the reserved pistoles and stir, trying very hard not to incorporate air bubbles into the chocolate. Another reading, and the temperature has come down nicely. I toss in the rest of the reserved chocolate, stir, take its temperature. Bingo. We are in the sweet spot, I think. 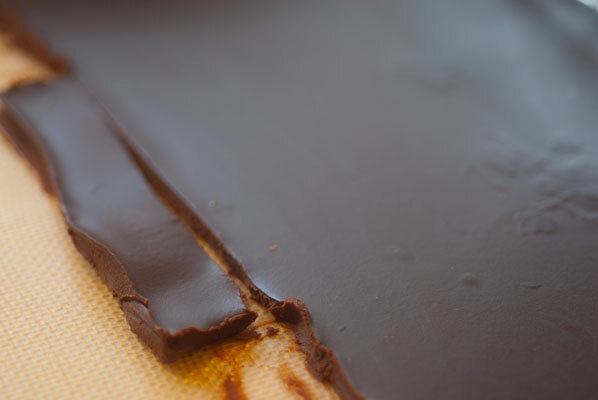 I do a test strip, with a small piece of parchment, and once it shows a good temper, I take a big breath and drop the first piece of ganache into the couverture. And the colourful language starts, as I fish out this one perfectly enrobed morsel, and attempt to tap off the excess couverture. 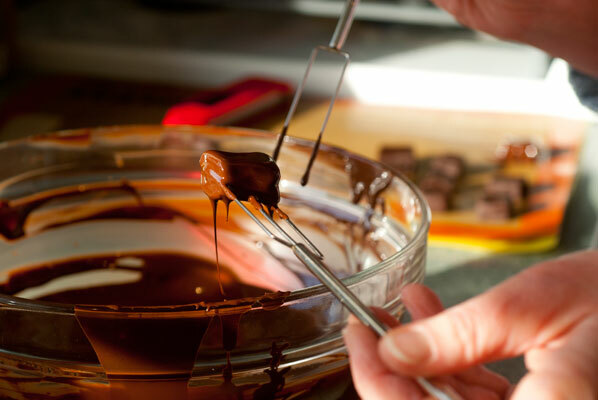 I can feel the prongs of the dipping fork going into the ganache and I want to cry. I manage to get the enrobed object to the mat, and attempt to slide it off the fork, and it does come off, but not without leaving an indent in the side. Next one – falls back into the couverture from between the tines of the fork, just as I have removed the excess chocolate. Deep breath, fish it out, get it to the mat. I try with one fork, instead of two. I need to do this quickly, with one implement. 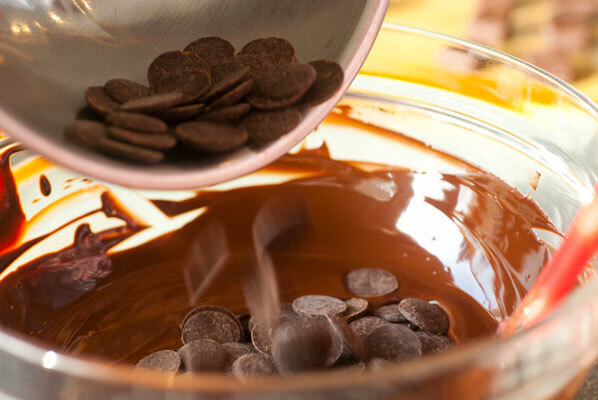 It does not work to use two, as too much chocolate stays on the bottom. The first couple have definite “skirts”, but the next couple are a little better. The good news is, the chocolate is staying in good temper. It is lovely stuff to work with. 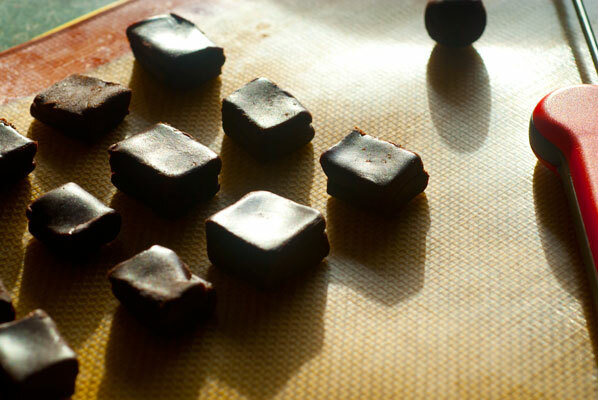 Once I have finished with the ganache cubes, I look around for something sturdy I can enrobe. I have some organic candied ginger, in cube form, and after rolling them around in my palms to get the excess sugar off, enrobe them, one by one. They are not perfectly cubed, but they hold up well, do not contaminate the chocolate (as was my fear), and are starting to look nice and glossy, as I finish them up. I pour the rest of the tempered chocolate onto the mat, and move the whole thing back into my bedroom, to cool. Hmmmm. This has been a mixed success. 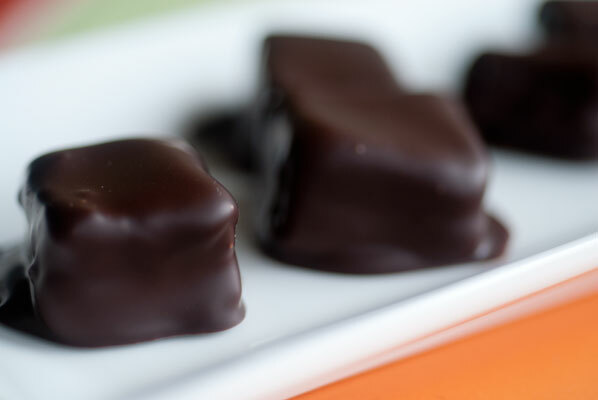 The cubes of ganache look glossy, but definitely have small pools of chocolate “round their bottoms. The gingers look a little better. I leave them for a few hours. 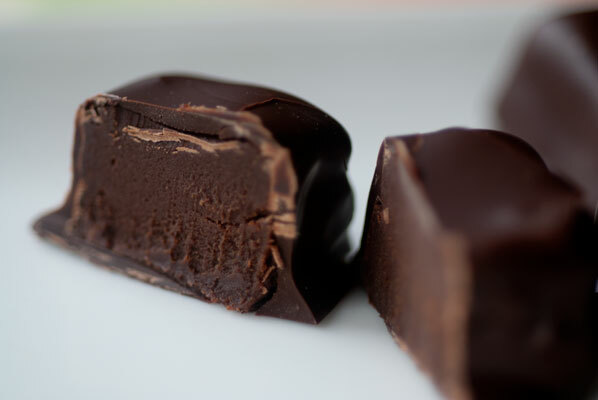 Upon my return, I pop one of the ganache cubes in my mouth. And I am filled with happiness. The outside shell snaps and crushes satisfyingly, giving way to a soft and beautifully textured inside. These actually taste quite lovely. 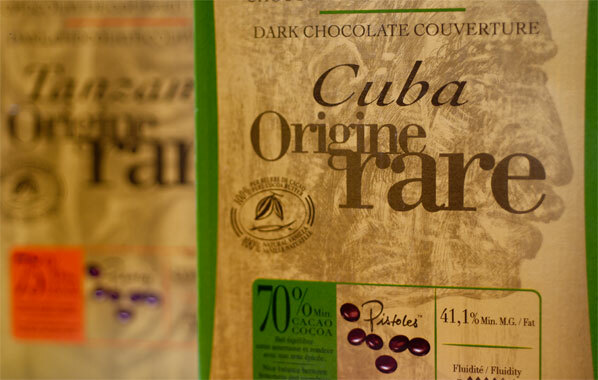 The CUBA couverture is winy, rich and smooth, with a bit of a pleasant tang. I bite into a glossy chocolate enrobed ginger. It pairs well with this couverture, and can stand up to its slight bitterness. And it too, breaks cleanly, snappily. Mmmmm. I guess I can do this thing called tempering. Well, I can do one method comfortably. I must confess, I really don’t like tabliering. 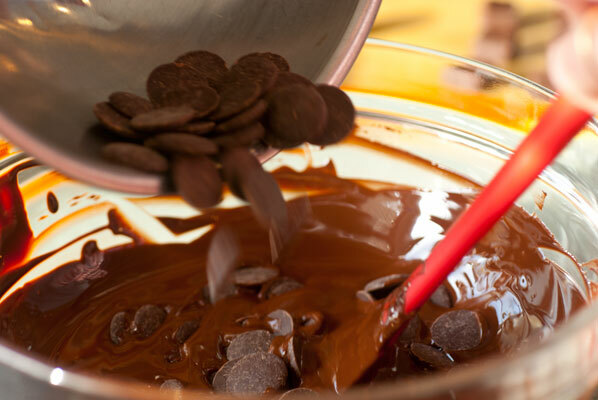 I find it messy and not relaxing, and I waste more chocolate than I am comfortable doing. I know the seeding method does depend upon an accurate thermometer, and precise weighing, but I think the science geek in me just loves all that! And I love having the pistoles. 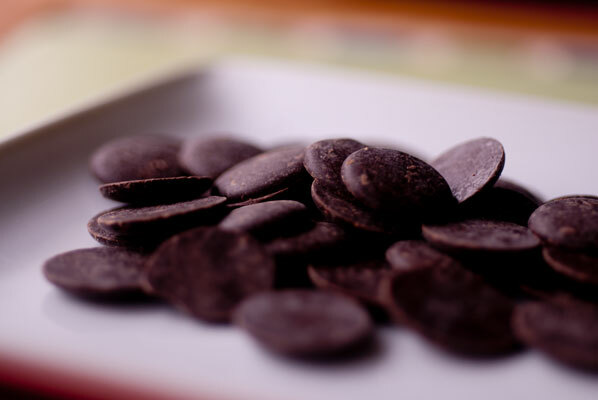 And yes, they are a luxury, so I will need to get into the habit of chopping up quantities of chocolate for seed, when I run out of my boxes of Origine Rare, but I am going to enjoy them to the last pistole. So, I am definitely sticking with seeding for now. And I will continue to enrobe small quantities of things, often, until I get it. Which clearly I don’t, yet. But that is the beauty of this journey. 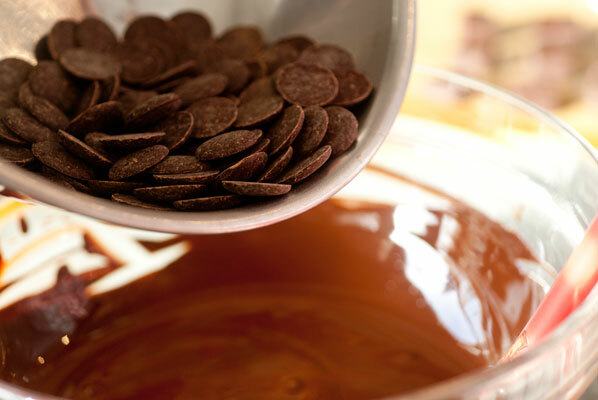 And as long as I continue to practice, I doubt that I will hear any complaints from family and friends, who are quite happy to eat anything, when it is covered in really fine chocolate.